I decided to stencil a feature wall in the boutique…but as with many of my projects, things evolve or morph a bit. Initially, I thought I might do it in charcoal ground with mid grey stencilled pattern over it, like on our business card. It would have looked lovely I am sure. But the other wall that is just in front and visually connected to the target wall is charcoal (and looks great !). As soon as I saw it done, I realised, doing the feature wall in similar colours would be too dark and too much of the same colour. The project called for a bit of tonal relief. What to do ? Well, the wall was already white. 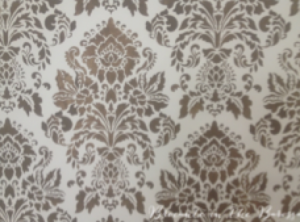 And a second pattern in our branding is the same damask pattern in a pale beige on white ground. I thought I would do that. I had been saving my precious quart tins of Chalk PaintTM decorative paint by Annie Sloan, the two I brought from USA in checked bags. Small samples had been taken out of them, but largely they were intact. I thought I might mix them, Coco with Old White, to make the beige. But again, my plan evolved. 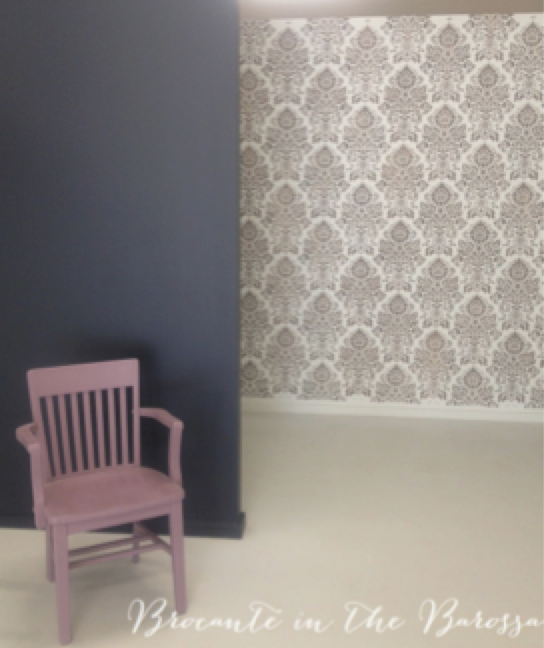 It seemed that given the long depth of the boutique space, a stronger tone for the stencilling would have more impact. So I did the stencilling in full strength Coco. A fabulous colour that looks like hot chocolate with some milk in it. It was the first time I have done an all-over wall pattern stencil. 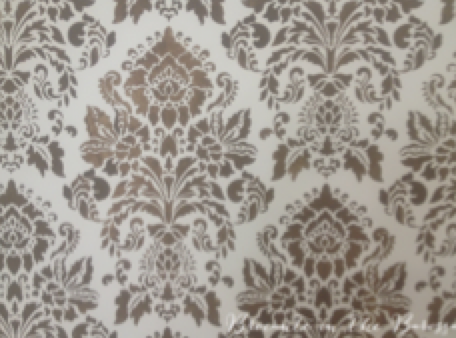 I used Royal Design Studio stencils, in this case Antoinette Damask, pattern 6101. We were very careful with the first pattern we stencilled, maybe overly deliberate. We started at the top of one corner of the wall, so Ian did that one, as it required being on the ladder. It turned out well, but the rest of the stencilling was better, as we relaxed a bit. Ian did a few of the patterns, but I did most of them, and quickly got some confidence on the ladder too, doing the rest of the top row. Getting things aligned was super easy—the stencil has a registration scheme in it, which gives a few shapes outside the pattern you are painting, and these you can use to line up the next placement and stencil pattern to paint. It gets the placement perfect and I must say I was doubtful how it might work. But the results speak for themselves, it came out great ! As I painted the wall with the beautiful stencilled pattern, it was great to see how subtle variations in the paint applied gave the finished result a look of hand-printed wall paper. 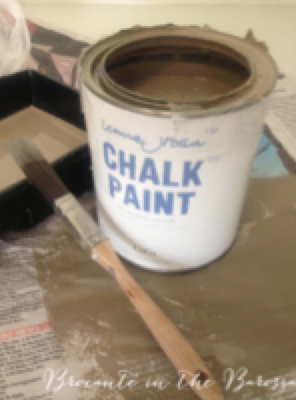 The texture of the Chalk Paint was perfect. It did not run, it has a good thickness for this project and dried it has texture that looks like what you see on vintage hand printed wall papers. Also, if you make a small goof and get a splodge of paint on the wall you did not mean (this did happen a few times on this project–I confess ! ), you can easily “erase” it with a small damp cloth. You just have to get to it before the paint is dry, and carefully rub the splodge or mark out with your damp clean rag/cloth. Too easy !! We left the bottom and sides and top edges for last, and used the pattern to carefully do a partial stencilled pattern to fill in. At the end we left on row not painted behind a shelf, but it looked funny and obvious, so I painted a column of patterns in to fill it, which did the trick. This project was fast. I was a novice, but did pay attention to the tip sheet. I used a dense foam roller as recommended. I was careful and took my time, pacing myself. And the wall was done in 4.5 hours time, which I thought was a pretty amazing result to achieve in just half of one day, starting after lunch and finishing before dinner. For this project, I used only a bit less than half of my tin of Coco Chalk Paint ! I was pretty impressed with this, and am delighted to have half and a bit more to use on some next project. very nice idea! It looks awesome!